Echoing similar challenges faced by states like Pennsylvania and Massachusetts, high business costs, global competition, and a strong dollar continue to ravage many of the state’s traditional sectors, while industries that encompass more high-tech and automation-based enterprises ares seeing consistent growth. 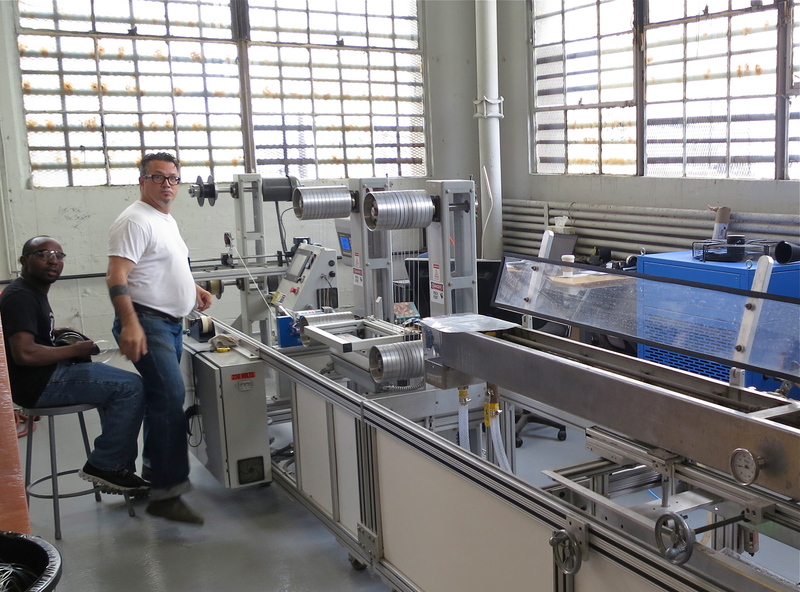 This article will explore major developments for New York manufacturing companies, delving into city, county, regional, and historical data collected by IndustryNet. We’ll also examine some of the challenges faced by New York manufacturers, and explore a number of creative measures state officials are taking to improve its industrial outlook. Declines over the year were led by New York’s printing/publishing sector, which shed 4% of its workforce, and remains the state’s top sector by number of industrial jobs. According to IndustryNet, New York’s printing/publishing sector has long been losing ground with employment in the industry plummeting 28% over the past decade, a loss of nearly 40,000 jobs. Apart from printing/publishing, New York industrial job losses were spread across multiple sectors, with rubber/plastics; medical instruments/related products; textiles/apparel; electronics; and lumber/wood leading losses. Only two industrial sectors in New York reported measurable increases over the year. IndustryNet data shows primary metals rose 2.3%, while food processing gained a half percent. Taking a look at regional data, employment losses were widespread across the state, with the New York Metro region losing 2.2%; and the Western and Central regions each shedding one percent. Upstate New York lost 1.7% of its industrial jobs. Next, we’ll take a look at some of the major developments in New York’s manufacturing sector in the years following the recession. A decade ago, New York was home to 18,819 industrial companies employing 828,362. Those numbers declined precipitously during the recession, and by September of 2010 the number of companies dwindled to 17,315 and the workforce shrank to 743,764. Today, the state is home to 15,186 industrial companies employing 681,342. In September 2010, layoffs had begun to slow, though the state still posted a massive 19,000-job loss between 2009 and 2010. Layoffs were announced at Pfizer’s Rouses Point plant; IBM’s Hopewell Junction facility; GM’s Powertrain engine plant in Tonawanda; Alstom Transportation in Hornell; and Emerson Power Transmission in Ithaca. But this year also brought some exciting new developments, helped by an improving economy and the state’s investments in advanced manufacturing We saw the expansion of contract chip manufacturer Globalfoundries; the opening of a new Beech-Nut baby food factory in Upstate New York the expansion of the Remington firearms plant in Mohawk Valley; and the opening of Canadian-based Smardt Chiller Group’s new facility in Plattsburgh. India-based Reva Electric Car Co. and Bannon Automotive also announced plans to build a plant in Clay for the production of plug-in vehicles. Sadly, that venture never came to pass, but still laid the groundwork for similar endeavors in the future. In this year, New York industrial employment losses slowed considerably, dropping by just one percent, as the recovery took hold in the state and across the U.S. New York’s highly-educated workforce and growing abundance of capital funding spurred growth in emerging “green” ventures. Norampac established a recycling plant in Niagara Falls, while companies like Irving Tissue in Fort Edward and wind turbine maker WindTamer in Rochester expanded their facilities. Other bright spots that year included Time Releases Sciences, Inc. expansion of their “Magic Eraser” cleaning supplies facility in Buffalo; Germanow-Simon’s expansion of their precision optics plastic injection facility in Rochester; and an expansion at Great Lakes Cheese in Adams. This was a great year for Upstate New York, with the region’s industrial workforce growing 2.5%. Industrial employment inched up about 1% in the New York Metro region, while jobs fell in the state’ Central region. This was also the year the Greek yogurt craze began to take hold, with the state holding its first-ever “yogurt summit” (that tradition has since continued) in August of 2012. This spurred the establishment of numerous yogurt plants: Argo Farma Inc. in Chenango County; Fage USA in Johnstown; and Alpina Foods in Batavia. PepsiCo, in partnership with German-based dairy company Theo Muller, also announced plans to open a new yogurt plant in Batavia. That plant has since changed hands, and most recently was sold in 2017 to dairy company HP Hood, headquartered in Massachusetts. Argo Farma is the former name for yogurt giant Chobani, LLC. Chobani went on to build an additional facility in New York, as well as a massive location in Idaho. That year did see its fair share of plant closures, however, including Steuben Glass Company’s factory in Corning; Crawford Furniture in Jamestown; Vertis Communications’ plant in Saugerties; and a Birds Eye factory in Fulton. Despite a number of exciting developments in the state’s manufacturing sector, this year brought another round of losses for New York State, though not as severe as reported in previous years. The state’s industrial workforce dipped 1%, led by losses in transportation equipment; furniture/fixtures; rubber/plastics; and textiles, among others. A major loss for New York that year was the closure of Sikorsky Aircraft’s facility in Horseheads. This facility was among several manufacturers that rely on federal contracts in New York and across the country that saw layoffs and closures as a result of cuts to the U.S defense budget. However, this was also the year 3D printing really took hold, then commanding $2.2 million in sales (global forecasts now put the market at $30 billion by 2022). Two of the most prominent 3D printing companies: Shapeways and MakerBot continued to gain ground, setting the stage for Brooklyn’s now-thriving maker movement centered around digital fabrication. Stratysys, manufacturer of 3D printers bought MakerBot that year for $600 million. We also saw the expansion of Regeneron Pharmaceuticals in Tarrytown, as well as the opening of Urban Electric Power’s battery manufacturing site in West Harlem. Byrne Dairy expanded their facility in DeWitt, as did Xerox in Webster. Manufacturing jobs in New York inched down in this year, led by continued declines in primary and fabricated metals, as well as lumber products, paper products and furniture. Layoffs at Eastman Kodak, Tyson Foods, and Lockheed Martin contributed to the state’s losses, as well as several facility closures, including an Alcoa plant in Massena and Philips Lighting in Bath. These were offset, however, by continued gains in the food processing sector – yogurt products in particular. FAGE expanded their yogurt plant in Johnstown, as did O-At-Ka Milk Products in Batavia; Cayuga Milk Products in Aurelius; and Emmi Roth USA in Penn Yan. Losses were most severe in the west of the state, but industrial employment rose 2% in the Upstate region. 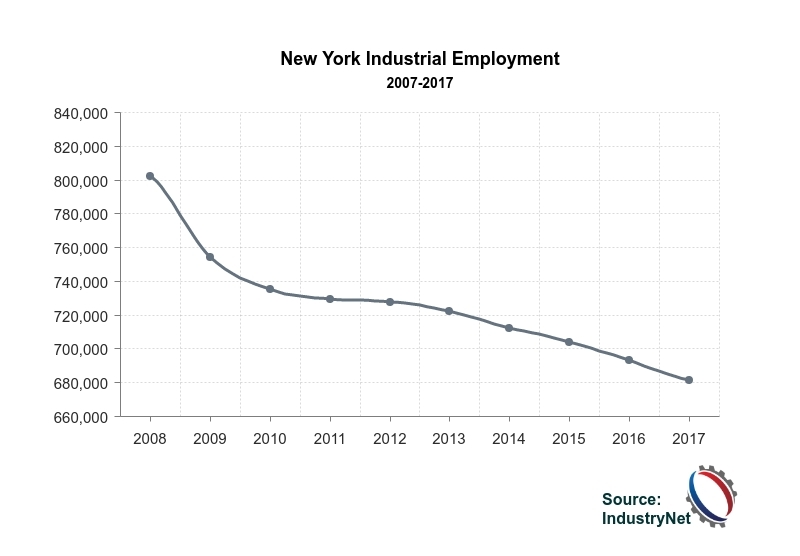 Industrial employment in New York continued on its downward slide, edging down another one percent, led by the printing/publishing industry as well as industrial machinery and electronics – the state’s three largest sectors by number of jobs. However, investments in new technology continued to boost the state’s industrial sector, most notably the transformation of the Brooklyn Naval Yard into a high-tech manufacturing hub, today accommodating hundreds of businesses and employing 7,000 workers. MakerBot expanded into their 3rd factory in Brooklyn and former MakerBot employees started up 3D printing company Voodoo Manufacturing that year in Brooklyn as well. In addition, Tesla and Panasonic unveiled plans to establish SolarCity, a massive solar cell manufacturing plant in Buffalo. This year brought more of the same, with New York industrial employment declining another one percent. 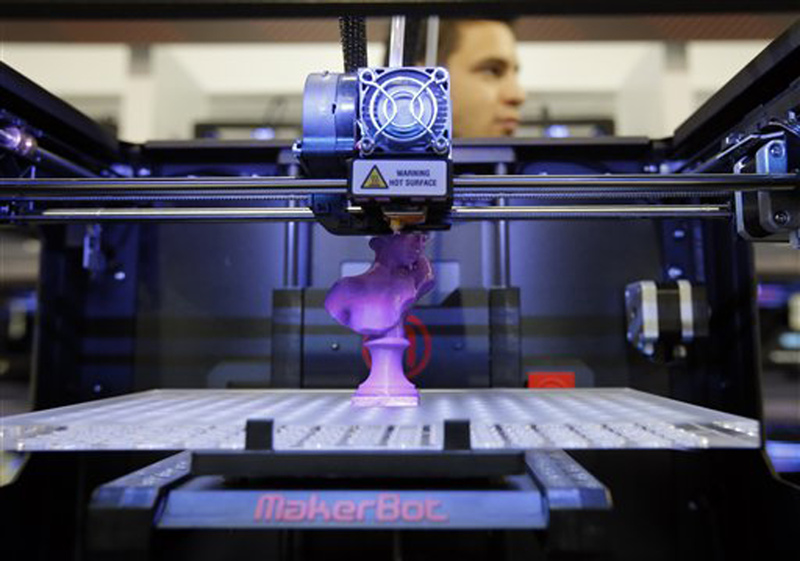 MakerBot made a major announcement of its plans to shift manufacturing operations to China. Chemours closed its reactive metals plant in Niagara Falls; SentrySafe closed its Pittsford facility; and Novartis shuttered its Suffern factory. Food processing continued to add jobs, however, with that sector up 1.3%. New York’s food industry received even more good news that year with Denmark-based Arla Foods’ plans to establish a cheese plant in Linwood, and the announcement of Starbucks’ new 20,000 square foot roasting plant in New York City, slated to open in 2018. Over the past year, industrial job losses were sharper than we’ve seen since the recession. A number of New York factories announced closures over the year, including Davis Vision, which shuttered its eyeglass lens facility in Plainview; Elmhurst Dairy in Jamaica; Cenevo’s envelope factory in Orchard Park; and Teva Pharmaceuticals in Pomona. Layoffs were numerous, and were seen at AirSep; Integer; Chemours; and MSG Manufacturing, among others. New plant announcements were sparse, and included Crown Holding’s new beverage can manufacturing operation, which recently started up specialty can production in Nichols. In addition, New Flyer broke ground on a factory in Jamestown for the manufacture of bus parts. With a GDP of $1.4 trillion, New York’s is the third-largest economy in the country, and its manufacturing sector also ranks third in the nation for number of companies and related jobs, according to IndustryNet data. New York is an undeniable powerhouse of manufacturing activity, but the state’s manufacturers have faced some serious challenges. New York manufacturers have long struggled with high business taxes, with the Tax Foundation ranking New York as the 49th worse state for business costs, after New Jersey. In addition, many manufacturers that rely on federal contracts have been vulnerable to defense budget cuts, and a strong dollar have made exports more expensive. New York also has the second-highest percentage of union membership in the nation, second to California, making it difficult to compete with states that boast lower labor costs. Looking ahead, however, there remains a bright side and cause for optimism. While many states struggle to find skilled workers, New York is home to one of the most highly-educated and innovative workforce in the country, recently ranked as having the 5th most educated workforce in the country by CNBC. The state is a top choice for high-tech enterprises and start-ups that require the skills needed for today’s advanced manufacturing. In addition to a skilled workforce, New York benefits from an abundance of capital funding, essential to the state’s thriving start-up culture. Numerous industrial hubs have cropped up across the state as a result, including the Brooklyn Naval Yards and “smart” labs like the Hudson Valley Advanced Manufacturing Center inspiring the next generation of cutting-edge manufacturing. According to a recent report by the Upjohn Institute for Employment Research, New York ranks second in the nation for the amount it spends on business incentives as a percentage of its economy, and efforts to relieve regulatory burdens are underway both by the state and the federal government. New York’s tax climate also improved considerably when the state passed a tax reform measure in 2014, completely eliminating the corporate income tax for manufacturers, which should serve to improve the state’s outlook going forward. Governor Cuomo also recently brought some innovative incentives to the state like new tax credits for beer manufacturers in New York City and special R & D incentives for life sciences companies. The state’s new START-UP NY program goes even further, offering a 10-year tax free zone to qualifying start-ups, which has so far brought in $251 million in investments and created 4,400 new jobs. The proposed tax cuts laid out by the Trump administration should represent a benefit to manufacturers already struggling with high business taxes – particularly in high-cost states like New York. A recent report shows all of these efforts may be helping, with manufacturing activity in New York hitting a three-year high, and 44% of manufacturers reporting improved business conditions. New York boasts a diverse industrial sector, with strongholds in machinery, pharmaceuticals, printing, and food processing. medical instruments. Here are the state’s top industries, regions and cities by number of manufacturing jobs, as well as its top employers, based on IndustryNet data. MNI’s extensive manufacturing data powers IndustryNet, an industrial marketplace that connects buyers with suppliers of 10,000+ products and services. IndustryNet allows users to search and source more than ten thousand types of products, parts, supplies, and services for free. IndustryNet® lists every U.S. manufacturer plus thousands of wholesalers & distributors and industrial service providers. To connect with industrial suppliers in New York and across the U.S. start your free search on IndustryNet. Or, to access detailed profiles of New York’s 15,000 industrial companies and their 43,000 executives, learn more about IndustryNet’s database subscription. Related Companies: Beech-Nut Nutrition Corp., Bio-Botanica, Inc., Bombardier Transportation, Byrne Dairy, Inc., Cascades Containerboard Packaging, Crown Holdings International, Inc., Eastman Kodak Co., Emmi Roth USA, Inc., Ernst & Young, LLP, Fage USA Dairy Industry, Inc., Great Lakes Cheese Of New York, Inc., GS Plastic Optics, HP Hood, LLC, IBM Corp., Data Systems Div., Koike Aronson, Inc., Lockheed Martin Mission Systems And Training, MakerBot Industries, LLC, New Flyer Of America, Inc., O-AT-KA Milk Products Co-Op, Inc., Pfizer, Inc., Regeneron Pharmaceuticals, Inc., Remington Arms Co., LLC, Sikorsky, A Lockheed Martin Co., Starbucks Corp., Stratasys, Inc., Voodoo Mfg., Inc., Xerox Corp.